Reynolds replaces Ian Mathews, who has taken on a post in the University of Abu Dhabi. Trinity has appointed former Eir Finance Director Peter Reynolds as the College’s Chief Financial Officer. Reynolds replaces Ian Mathews, who served in the role since 2009, and has left the College to take on the post as Vice-Chancellor of Administrative and Financial Affairs at Abu Dhabi University. 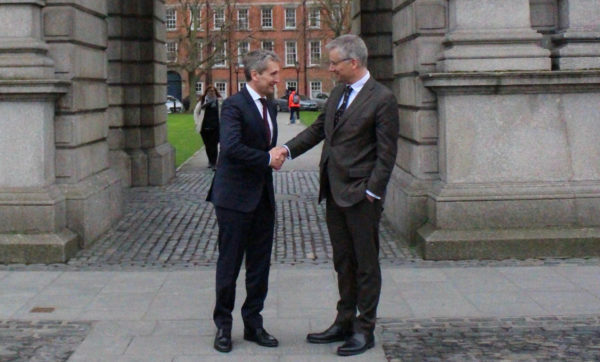 Provost Patrick Prendergast tweeted today that he was “delighted” to welcome Reynolds to Trinity. “Welcome aboard!”, he said. Reynolds has served as Group Finance Director of technology company Eir since 2012 and held other roles in the company prior to this. In April, Trinity’s Financial Services Division, led by Mathews, was named Finance Team of the Year at the Irish Accountancy Awards. “Having experienced huge organisational change over the last 10 years, I am very proud to say that every member of our team has contributed to our transformation into the high performance finance team we are today”, he added. Mathews managed the College’s finance at a time when the university has faced huge financial struggles, with a severe lack of government funding for higher education. In a press statement, Mathews said it had been a “pleasure and a privilege to work in Ireland’s premier University”. “I have thoroughly enjoyed my time working with great people throughout the organisation and I want to thank all who have supported me over the years. After 24 years in Trinity, it will be a significant change however I am excited about the future and relish the challenges ahead”, he said.